Cycling along the roads of Angkor on my cruiser, basket in front, felt slightly retro as I watched the cars, tuk tuks and tour buses drive by. We weren't out-of-place given the steady stream of bicycles ridden by foreigners and Cambodians around us, but I would have given anything to have been transported back a few decades when there wasn't so much road traffic at this UNESCO World Heritage site. I would also settle for being wealthy enough to be able to donate money for the construction of a bike path. Alas, neither were going to happen. Biking around Angkor, however, still beat the alternatives and there were only a few stretches where motorized vehicles outnumbered us. 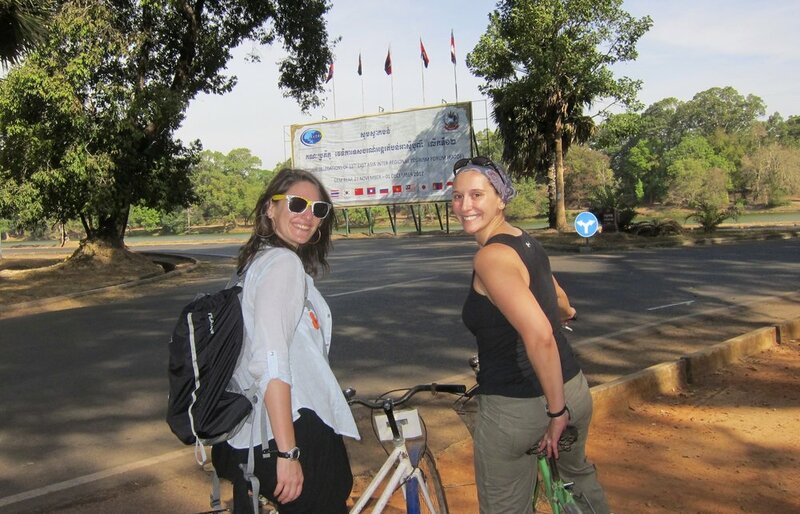 There are two main options when biking around Angkor - the long or the short loop. Since we had seen a number of temples on the long loop the day before, we opted for the short loop to see new things and to avoid utter exhaustion once the heat peaked in the early afternoon. We love to bike in parks and historical places because you tend to see things you miss from a car, tuk tuk or a bus. In a place like Angkor full of rich ancient and historical places, biking proved again to be the right choice. After entering the park and getting our pass punched, we settled on circling the loop in the opposite direction most people choose. Heading to the right at the main entrance, we averted the early morning crowds at Angkor Wat and Angkor Thom and had a good portion of the road to ourselves. A wide shoulder welcomed us and was only interrupted by the occasional tree. "Like it, love it or think it's just okay?" Dave yelled from behind me. "Love it!" I exclaimed as I pedaled along the water way of Angkor Wat beneath the shade of the tall trees. Soon after my proclaimed love of the road, the shoulder disappeared and a few tour buses passed us. "It's just okay now," I said to myself. The road never regained its shoulder, but I regained my confidence and wound around the park until reaching Banteay Kdei and Sra Srang. Banteay Kdei was our first temple of the day and we had it mostly to ourselves. It was a Buddhist monastery built in the 12th century. I don't think it's been touched since then. Banteay Kdei walls in a bit of disrepair. Pedaling on, we were anxious to reach Ta Prohm (the famed temple from the film Tomb Raider). We quickly approached a stretch on the road where we saw tuk tuk after tuk tuk passing us in the other lane - all with no passengers. A tuk tuk with no passengers in Angkor is like a taxi with no passengers during a thunderstorm in New York City. Completely out of character. There are only a few temples in Angkor that get really crowded and it was apparent we were approaching ours for the day. We arrived at the entrance to Ta Prohm and hit a wall of huge tour buses and tuk tuks letting out passenger after passenger. The empty tuk tuks we saw had been dropping their passengers off at this entrance and then picking them up at the other end. It was almost 11 a.m. so we thought we would take a break underneath the trees lining the temple's entrance, eat a snack and wait for the tour groups to go to lunch. We got the break we were looking for, but the groups never subsided. Without many alternatives, we entered the temple after a group of Aussies and did our best to break away from the crowds. I came upon the most famous part of the temple and hit another wall. This time it was a wall of tourists all clamoring for their chance to take a picture, or have their picture taken, with the giant tree whose roots have overtaken a temple entryway. I sat on a stone and watched the madness ensue for a good 10 minutes. Waiting that long proved fortuitous and I eventually had the tree mostly to myself (for a whole 10 seconds). Ta Prohm being swallowed by tree roots. We had the right idea in trying to wait out the lunch crowds and it paid off as we entered the gates to Angkor Thom. The 10 sq km Angkor Thom complex is a city itself and could keep anyone occupied for a day if you explored all its buildings. 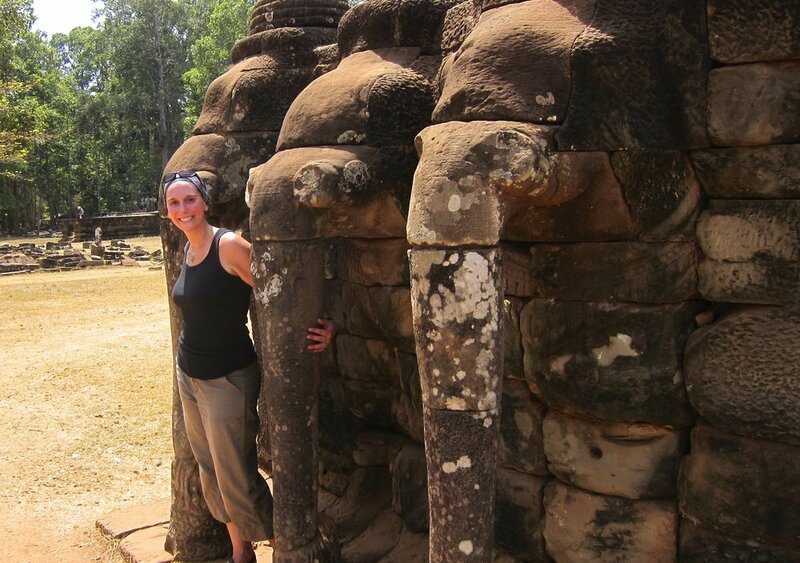 I took a break to hang with the elephants along the giants walls of the Terrace of the Elephants before we pedaled on to Bayon, our last stop of the day. Angkor Wat is impressive and mesmerizing, but nothing really prepared me for Bayon. As one of the last temples built in Angkor, it stands tall and proud directly in the center of Angkor Thom. Its 216 smirking faces look out to the horizon, daring you to take a closer look. None of the guidebooks list Bayon as a place to visit during the down hours of lunch, but we found it relatively uncrowded and full of cool entryways to relieve us from the heat. Climbing a steep set of stairs, we reached the top of the temple where we wandered around the giant faces. They all had a bit of a different look and are preserved rather well given their age (wrinkle free even!). After spending a good hour at Bayon, we hopped back on the bikes to head to town for a late lunch and a much-needed dip in the pool. If we had more energy, walking around the other Angkor Thom temples would have capped off a great day. -As with any day in Cambodia, bring lots of water and sunscreen. There are water vendors throughout the park so you'll have opportunities to replenish and get a cold bottle. -Take a map with you so you know what temples you're coming up on when. -The time of the route depends on how fast you ride and how many temples you visit. -There are bike rentals all over Siem Reap and at many guesthouses/hotels. The road is flat and relatively easy so most bikes will suffice. If you can get a lock, it's probably a good idea within the park, but probably not 100 percent necessary. Most bike rentals in the city are anywhere between $2-$5 and you can actually get a decent mountain bike for that $5. The cheapest bike rental I've ever seen! Just be conscious of how far your rental is from the road to Angkor. While biking in Angkor isn't all that far, you tack on a number of miles getting from Siem Reap to the park entrance. 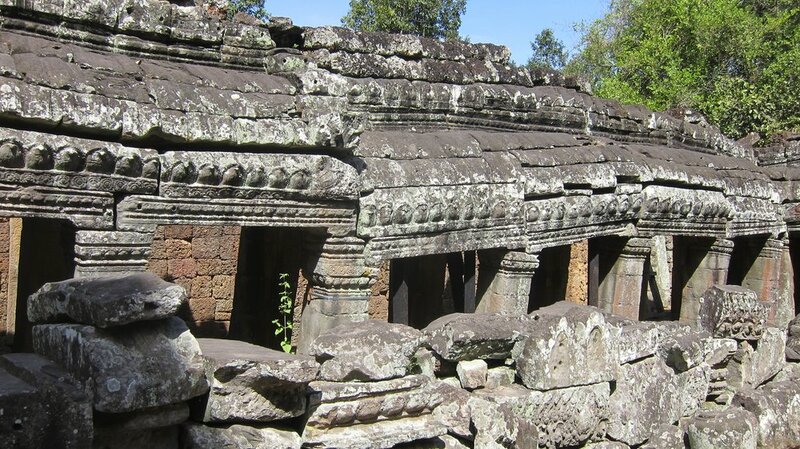 -If you don't want to go on your own, Grasshopper Adventures has a nice outpost in Siem Reap and offers day tours. The basic tour is very reasonable at $33 a person. We also saw an Angkor guide picking up a couple at our hotel on a bike so it's possible to find guides who will bike with you. I'd recommend asking at your guesthouse or at a local bike shop.